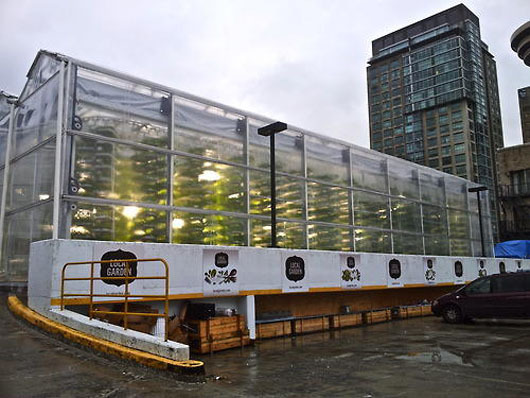 On the top level of a downtown Vancouver parking garage, North America's first commercial vertical farm has set up shop. 'Local Garden' converts an impermeable, polluted, heat-generating and underused urban surface into arable 'land', and plans to grow an estimated 150,000 pounds of greens and herbs for the local market this year. The humble exterior of the structure that houses the facility does nothing to hint at the sci-fi, high-tech interior, which resembles a food production unit on the set of a 1950's futuristic film. Trays of hydroponic growing medium, stacked twelve high, are in constant motion along a conveyor belt, and the aesthetic is minimalist white to the max. Each tray is tufted with its crop, be it kale, spinach, arugula or basil. The produce is packed on site and delivered to market the same day. The project works skillfully with the site's constraints, converting obstacles into opportunities. 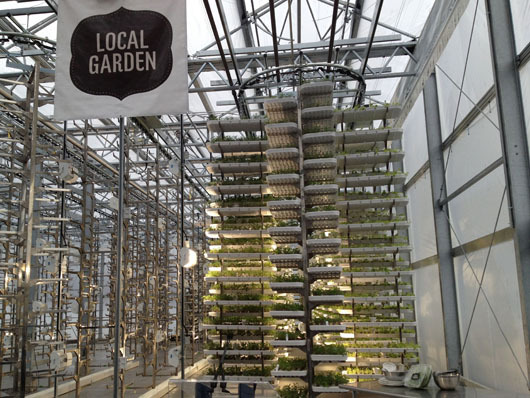 The sixth floor location maximizes exposure to sun, which is often an issue for gardens or farms in central urban areas, and mitigates wind effects (increased water loss) through the use of a protective greenhouse. VertiCrop™ provides a cost effective solution for local crop production with significant operating cost savings over traditional field agriculture. This patent pending technology represents a paradigm shift in farming and food production by providing up to 20 times the yield of field crops, while using a mere 8% of the water required for land farming. 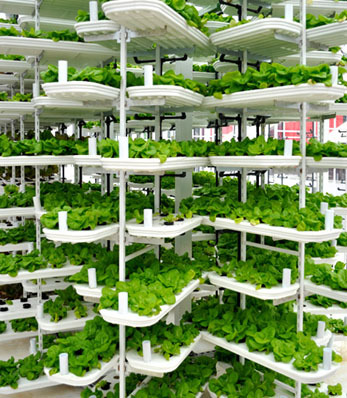 Growing leafy green vegetables in a unique, suspended tray configuration on a moving conveyor system, VertiCrop™ provides maximum exposure to light (either natural or artificial), along with precisely measured nutrients for each plant. Designed to grow in closed loop and controlled environments, VertiCrop™ eliminates the need for harmful herbicides and pesticides, while maximizing food taste and nutrition. Haven't we been here before - in the promised land of technological fixes? I tend towards the old-fashioned and earth-bound I guess, honoring that we have all we need already to sustain ourselves, and that gadgets, rather than helping, actually create more problems in the end. In this case such problems might be energy use for operation, maintenance needs for the system, and whatever pollution is created through the production and transportation of the trays (the material of the trays is not specified). And to the cost - the 6,000 sf facility cost $2 million to build, which equals $13 per pound for the first year's harvest, and represents at least a 7-year ROI, suggested a continued corporat-ization of food production. What do you think? Do we benefit from high-tech explorations and advances, or would we be better off returning to the basics? sources: middle image via metronews; bottom image via alterrus; additional reading at the star.